In any new tech, there are lots of thoughts around “best practices”. When a tech is new, what makes a best practice? Working at Microsoft, running the Azure Container Registry (ACR), talking with lots of customers, some that use Azure and some that don’t, we’ve had a lot of exposure to what customers have encountered. We’ve been working on a number of scenarios, including container life cycle management and OS & Framework patching with containers. This has surfaced a number of interesting issues. Issues that suggest, “both sides” of the tagging argument have value. It’s easy to get caught up, arguing a particular best practice, …if you don’t first scope what you’re practicing. I’ll start by outlining two basic versioning schemes we’ve found map to the most common scenarios. And, how they are used together to solve the container life cycle management problem. Before I get into specific tagging schemes, it may help to identify a specific scenario impacted by your tagging scheme. The most basic container scenario supports restart type policies. docker run --restart always myunstableimage:v0 This helps when a container fails due to some internal reasoning. But, the host is still available. In this case, our code must be resilient. Or, to an old friends point (Pat Helland), “we must write our software with a apology based computing approach.” Apology based computing suggest our code must deal with “stuff” that happens. A set of code, or a container may fail and need to re-run that logic. For the purposes of tagging, I’ll stay focused on the other aspect; we must assume a container host may fail at any point. Orchestrators will re-provision the failed node, requiring a new docker pull. Which begs the question: when you have a collection of containers running the same workload, do you want them to all run the same workload, or some of them have the last version, while new nodes have a newer version? a local build of 3 images: web:1, api:1, cache:1. Looking closely, we can see every tag has an ID, otherwise known as a digest. When the images are pushed to a registry, they are stored as two parts. The image:tag, and the underlying digest. These are actually separate elements, with a pointer between them. A deployment is made, using the tag. Not the digest. Although, that is an option. Digests aren’t as clean as I show here. They actually look like this: f3c98bff484e830941eed4792b27f446d8aabec8b8fb75b158a9b8324e2da252. 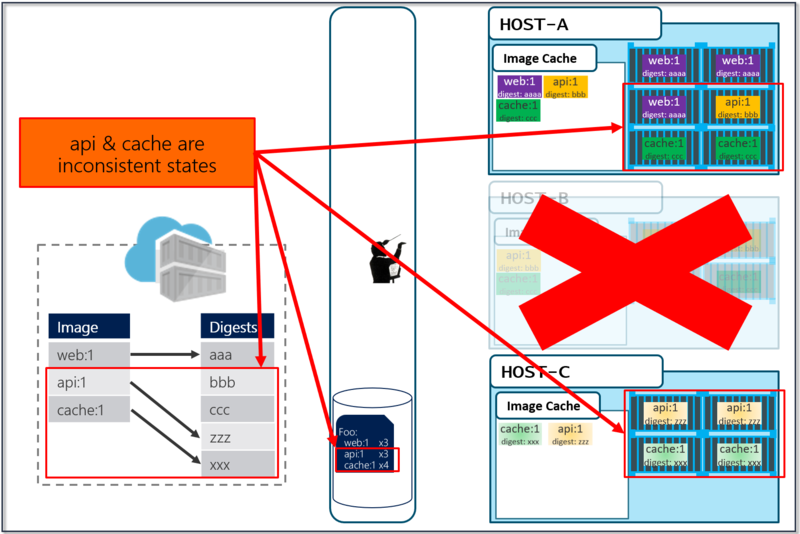 Not something I can easily fit in this diagram, and certainly not something you’d want to type, or even try and visually find when looking at the containers running in your environment. With a deployment saved, the orchestrator starts its work. It evaluates what nodes it has to work with and distributes the request. As our development team moves along, a new version of the api and cache are built and pushed. Since this is just a minor fix to version 1, the team uses the same tag. At this point, you likely see where this is going. As Pat would say “Stuff Happens”. Actually, Pat would say something else. Our Host-B node has failed. No problem, our orchestrator’s job is to maintain a requested deployment. It sees the failure, evaluates the request made of it, and provisions the necessary resources to recover. Our deployment chart clearly says, keep 3 copies of web:1, 3 copies of api:1 and 4 copies of cache:1. So, it does a docker run of each of those image:tag combinations. It’s doing what it was told. Is this the desired state you want? The orchestrator did it’s job. It was told to deploy and maintain a given set of images. The problem was actually further upstream, when we re-used the same tag for our images. While I believe in “never say never”, using stable tags for deployments are fraught with problems. However, Stable Tags do have their value. Let’s consider what happens when developers stop checking in code changes. In the VM world, Ops would continue to patch the running hosts for updates to the framework and patches to the host operating system. And, at some point, those patches may break the apps running on those nodes. One of the many benefits of containers are the ability to isolate the things our apps and services depend upon. Those dependencies are contained within our image, declared within our dockerfile. For the focus of tagging and OS & Framework patching, notice our base image, used for the image we actually deploy. You can see we’re using the stable tag, 2.0. This is where semantic versioning does play a role. The ASP.NET Core team releases new capabilities, indicated by the major version. They shipped 1.0, 2.0 and you can imagine they’ll continue to ship new capabilities. In the real world, new capabilities means things change, behaviors change, and thus, you want the development team to make a conscious choice which major version of aspnetcore they depend upon. This basic pattern is used across all major frameworks, java, go, node, etc. While the team focuses on new capabilities, they must also service each version. The aspnetcore image contains aspnetcore, dotnet core, as well as linux or windows server nanao base layers, depending on which architecture you’re running. How do you get OS & Framework updates? Should you have to bump your FROM statement for every release? While the team will publish additional tags for minor, non-breaking changes, each team does update their stable major tags. This does mean, depending on when you pull aspnetcore:2.0, you’ll get different content. But, that’s the intent. Whenever you pull the stable tag, you should get the latest OS & Framework patched image. I say should as not all repo owners do proper maintenance on their images. Why, because it’s actually pretty hard. (insert smallest fiddle) . To stay focused on tagging schemes, I’ll point you this post on OS & Framework Patching with Docker Containers – a paradigm shift. What Tagging Scheme Should I Use? A framework team ships 1.0. They know they’ll ship updates, including minor updates. To support stable tags for a given major and minor version, they have two sets of stable tags. :1 – a stable tag for the major version. 1 will represent the “newest” or “latest” 1. * version. :latest which will point to the latest stable tag, no matter what the current major version is. What’s not quite captured above are servicing releases to any of the given tags. As base image updates are available, or any type of servicing release of the framework, the stable tags will be updated to the newest digest that represents the most current stable release of that version. In the above example, updates are provided for the specific versions. In this case, both the major and minor tags are continually being serviced. From a base image scenario, this allows the image owner to provide serviced images. If you really wanted to bind to a specific image, that never changes, you’d set your FROM statement to the digest. However, I’d highly suggest “never” doing binding to a digest. Yeah, I went there – never. If you bind to the digest, how would you get servicing of your base image? Unique tagging simply means, every image pushed has a unique tag. Tags are “never” reused. We’ve had a number of customers request the ability to enforce this policy, which we’ll be adding to ACR. Along with several other policies. What value should use for your unique tags? git commit – works until you start supporting base image updates, where your build system will kick off, with the same git commit as the previous built. However, the base image will have new content. Using a git commit winds up being a semi-stable tag. date-time-stamp – this is a fairly common approach as you can clearly tell when the image was built. But, how do correlate it back to your build system? Do you have to find the build that was completed at the same time? What time zone are you in? Are all your build systems calibrated to UTC? digest – it’s unique, or should be. But, it’s really not usable as it’s just toooooo long. And, it doesn’t really correlate with anything easily found. build id – this one is closest to the best as its likely incremental, gives you correlation back to the specific build to find all the artifacts and logs. <build-system>-<build id> – If your company has several build systems, prefixing the tag with the build system helps you differentiate the API team’s Jenkins build system from the Web teams VSTS build system. Whew, that was a lot… As with many things, an answer, especially a best practice, depends on ___. Hopefully I’ve given some context for the various tagging schemes, and the reasoning behind them. You may have a good reason for deploying stable tags such as a test environment. But, just realize that images will be updated underneath, and you can very easily spend hours troubleshooting a node that pulled a slightly different version of that tag. Posted in Azure, Container Registry, Docker, Docker Registry, Tips and tagged Containers, Docker. Bookmark the permalink. I think the server folks are trying to enable exactly this scenario. For example, they have microsoft/nanoserver:1709_KB4074588, which presumably will never change, and using this tag in a base image is equivalent to using the digest. Actually, isn’t using that kind of tag one of the most foolproof ways to ensure I do get OS updates when I want them? Otherwise, I’m at the mercy of whatever the build server happens to have cached for the stable 1709 tag when it builds the image, right? There was another section that I was going to write, where you can combine stable and unique tags. What the server team is doing is releasing specific KBs for Windows, but they are included in the ‘newest’ stable tag for that release train. It allows a team to test a specific KB. In fact, even the KB tag may get serviced. Similar to the section where I showed 1, 1.0 and 1.1 getting serviced. The thing I didn’t go into on this post was how OS & Framework patching would work. If your dockerfile says microsoft/nanoserver:1709 your build would get updated if you subscribed to the base image updates. As that tag is updated, ACR Build will get notified of the updated base, and trigger your build.